Above, an Artesia Police Department Community Service Officer arrives on the scene of a two-vehicle wreck just after noon Thursday at Sixth and Main streets. According to police reports, a black GMC SUV was heading west on Main when it was struck from behind by a grey Ford pickup. Damage was estimated at $2,000, and no citations were issued. 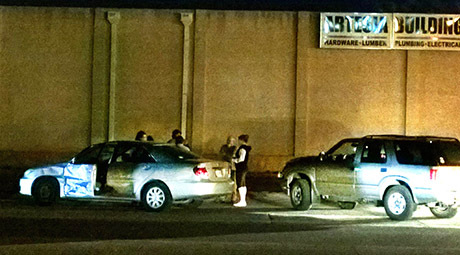 Below, a silver Toyota four-door and silver Chevrolet SUV sit adjacent Artesia Building Supply at 13th and Main streets following a wreck just before 9 p.m. Thursday. The driver of the Toyota said she was headed north on 13th when, upon entering the intersection, she was struck by the SUV. The SUV’s driver stated he had been eastbound on Main intending to turn right onto 13th when he changed his mind and decided to go straight. Prior to that decision being made, witnesses told police, the light on Main had turned red, and the SUV driver struck the Toyota, which had the green light. 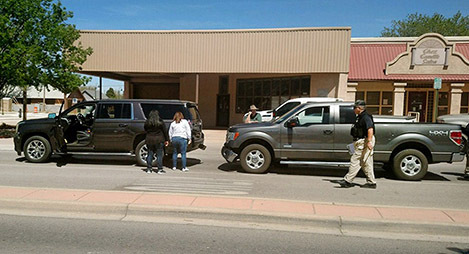 The driver of the SUV was issued a citation for a red-light violation.